Europa has started 2013 by launching a new Total Facilities Management service with a London borough council worth in excess of £15million. Working in partnership with Brent Council for an initial five years, Europa has commenced provision of facilities management services including security, cleaning, washroom services, landscaping and pest control across the Council’s current buildings. In addition, from April 2013 Europa will also provide full FM services including maintenance, mechanical and electrical works and repairs, and car park management for the newly constructed Brent Civic Centre. A function and catering service will also be provided offering high-quality events for the local community and a restaurant serving hot and cold meals, snacks and ‘grab and go’ options. In addition, a premium refreshments bar will serve slow-roasted, fair trade coffee as part of the offer to provide the best possible in-house value for Brent Council employees. 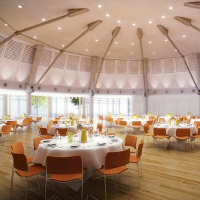 The Civic Centre will be greenest public building in the UK and the fourth greenest in the world, making best use of natural light, ventilation, rainwater harvesting, an indoor winter garden and green roofs. The building also features, sustainably sourced building materials, 250 secure bicycle parking spaces, charging points for electric cars, efficient waste disposal systems which maximise recycling, energy saving IT systems and highly efficient heating and cooling systems.